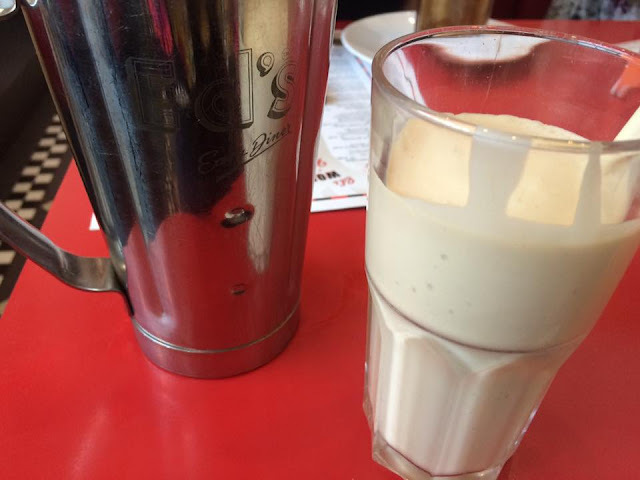 In what was described as a summer food safari, myself and three other bloggers got to taste a separate course at three popular chains at the Oracle shopping centre in Reading, beginning at Ed's Easy Diner. Located near the Broad Street entrance of the Oracle, it's menu boasts a variety of burgers, hot dogs and milkshakes. It was actually the latter we would be trying out for our unconventional starter and settling on just one flavour was quite the challenge. Whilst mint chocolate, Nutella, Oreo and the limited edition summer flavour, Reece's had me uhm-ing and ah-ing, it was the Lotus Biscoff option that won my vote in the end. Our drinks were served up super quickly and I bowled over by the portion size - one milkshake equates to just over 2 full glasses! What's more is it was the perfect thickness and the caramelised biscuit spread in milkshake form was a taste sensation. The decor at Ed's is fun and retro and the working mini duke boxes on each table are a nice touch. 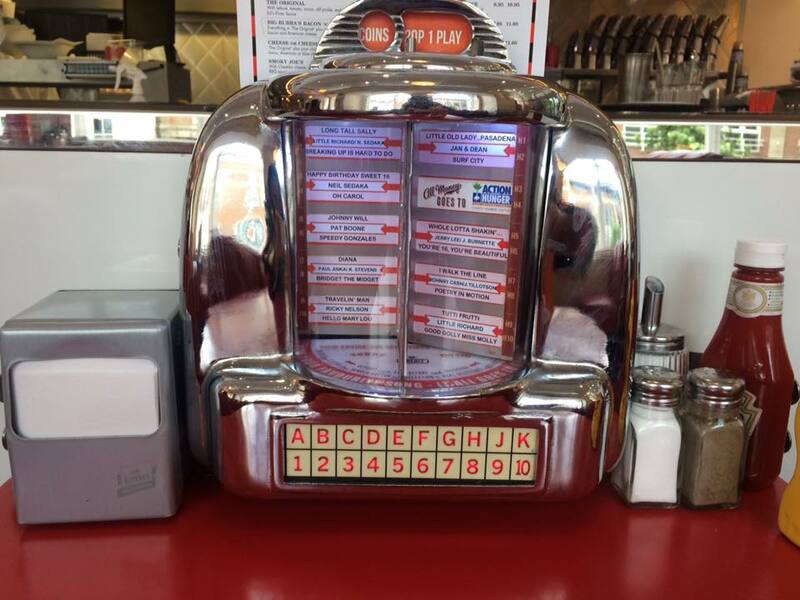 All you do is pop 20p in the slot and choose from the catalogue of 50's tunes including Elvis and The Beach Boys. What's really cool is all the income from the dimeboxes goes to the company's chosen charity of the year, 2016's being "Action Against Hunger". 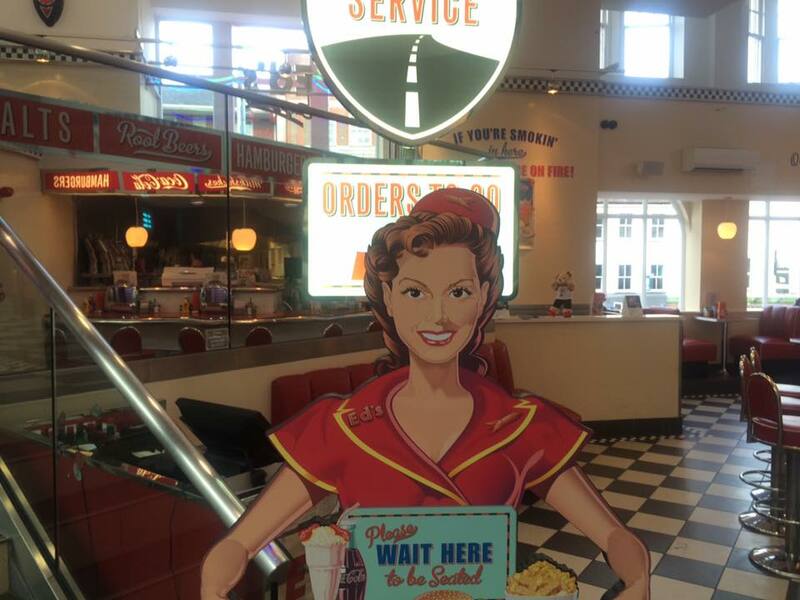 Be sure to download the Ed's Easy Diner app as you get a free burger, a treat for your birthday and their loyalty scheme means you get 10p for every £1 you spend in one of their branches. I know I'll be heading back to try out their desserts and with treats like Waffle Popcorn Cheesecake and Nutella Waffle S'mores, can you blame me?! Ed's have a separate gluten-free menu and whilst there are vegetarian options, choices for vegans seem limited. Whilst we're on the subject, quite a few of my readers are vegetarian/vegan, I wanted to warn you that meat features heavily in the main so please feel free to skip to dessert - I don't want anyone to offend or upset anyone. I have a vegan food post coming soon so keep an eye out for that! 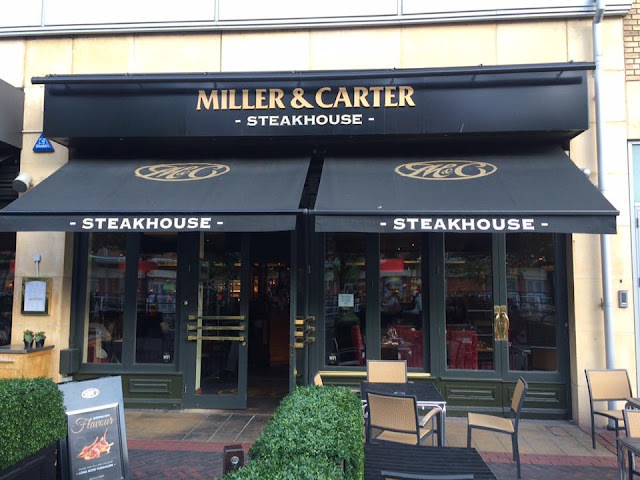 The milkshake was super filling so it was just as well we had the opportunity to work up an appetite on the stroll over to the Riverside for our second stop, Miller and Carter Steakhouse. On arrival, we were instantly fussed over by our very knowledgeable, tentative and passionate waiter. Waiting time for food was quite long here but once served, it was clear to see why it had been more timely: THERE WAS JUST SO MUCH FOOD. 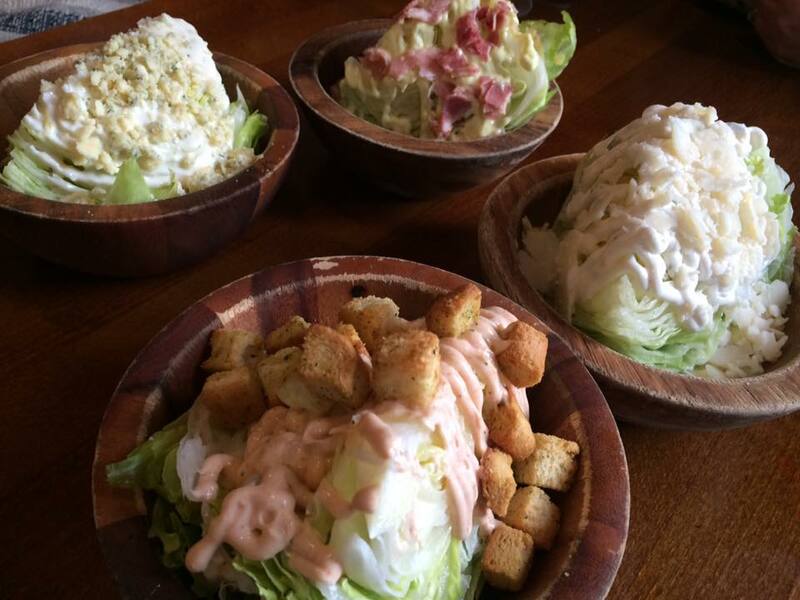 First out were the salad wedges - great big chunks of lettuce with an assortment of toppings including parmesan, blue cheese and bacon. We were completely spoilt with every carb and sauce available on the menu. 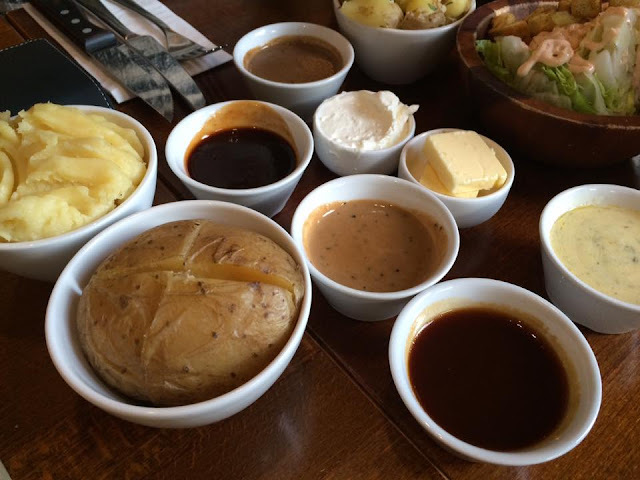 Sauces included peppercorn, beef dripping, bordelaise and mushroom and garlic and I'd never seen so many different types of potato on one table! As for potato, we had mashed, jacket, sweet potato fries, normal fries and new potatoes. 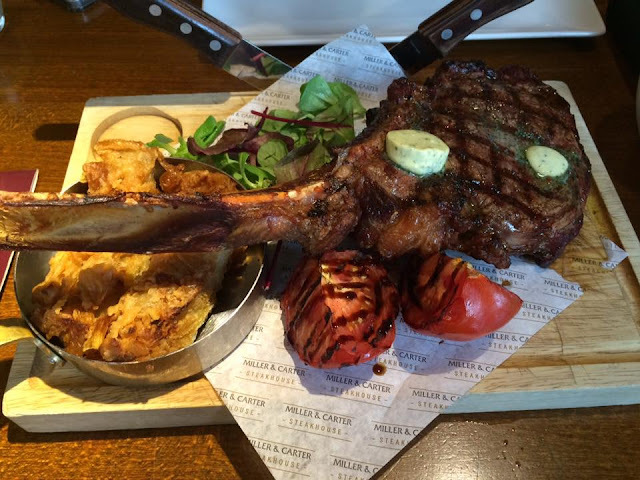 Presented last were the 3 sirloins and the visual showstopper was the absolutely huge 300z Lone Bone Tomahawk steak for us all to share. 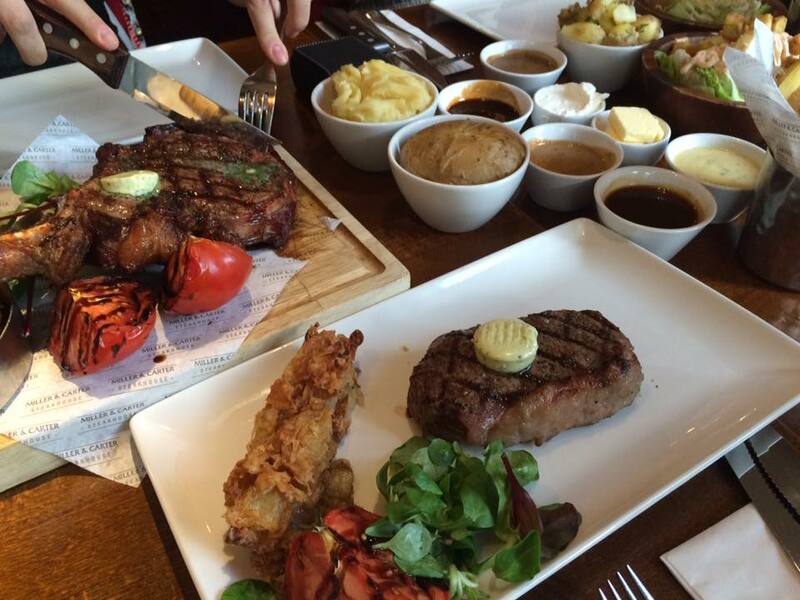 The sirloin was one of the best I've had, beautifully cooked, melt-in-the-mouth and juicy. The section of Tomahawk I tried was slightly more well done and therefore less moist than I would have liked, but delicious all the same. Each came served with parsley butter, an onion loaf (like a homemade onion ring but baked and in a stacked rectangle shape, rather than a ring) and a balsamic glazed beef tomato. I prefer having my steak with garlic or parsley butter rather than a sauce so I like that this comes standard at Miller and Carter. The onion loaf was a fantastic onion ring alternative, super sweet and crispy, I kept going back for more! Our waiter had specially selected Newton Johnson Full Stop Rock wine to compliment our dinner. I'm not usually a red wine drinker but it was a wonderful pairing with the steak. We were treated like royalty at Miller and Carter and I would definitely recommend them as a go-to for a special occasion or romantic date. Lamb, pasta dishes, lobster, burgers and ribs are also on the menu if you aren't fussed about steak. Gnocci and various salads are available for vegetarians but again, there's slim pickings for vegans. After a tasty but heavy main, it was great to head over to our final stop for an assortment of light desserts and refreshing cocktails. Las Iguanas is a Latin America themed restaurant I visit regularly but usually fill myself up with a starter and a main and have no room for desserts. I'm pretty familiar with their cocktail menu as they have Happy Hour, all day everyday. We were served Caipirinha cocktails, a fitting choice as the Olympics are currently going on in Rio and this was all I drank whilst travelling out there. Made up of cachaça, fresh lime & sugar, its super fresh and not dissimilar to a mojito. 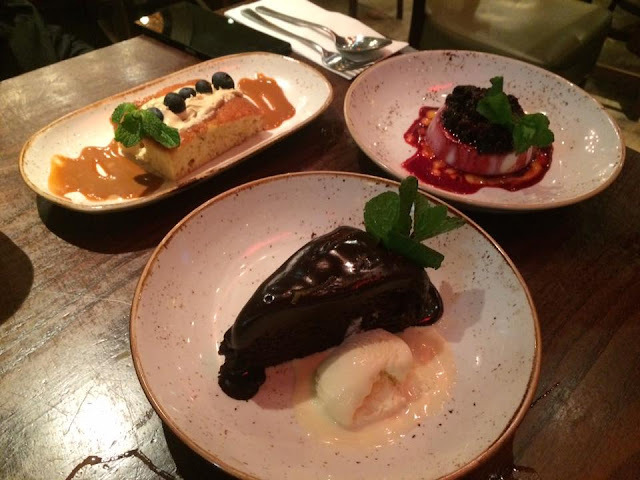 As for sweets, we somehow had to find room for churros, the aztec fudge cake, creamy caramel cake and tembleque which thankfully wasn't too hard as they looked and tasted divine. Starting from the left, the caramel cake had a bouncy soft vanilla flavoured sponge with caramel sauce and topped with blueberries. I am salivating dreaming back to what was for me, the highlight of this course, the aztec fudge cake. Gooey orange and spiced chocolate sponge, rich with fudgey sauce and served with icecream. It was just so tangy and almost boozy in flavour - yum! As I'm not really a lover of panacotta-type desserts, the texture of the tembleque pudding wasn't my favourite but its sweet coconut flavour was lovely and it was topped with a fruity mango puree. Churros are one of my favourite things, if they feature on a menu, I'll be having them. I love how Las Iguana present them in a cute paper bag and serve them with both caramel and chocolate, rather than making you choose one of the two. I just wish they were more liberal with the cinnamon! I adore the vibrantly coloured interior and it's a great place to visit with friends, their outdoor seating area overlooking the river is my preferred spot. 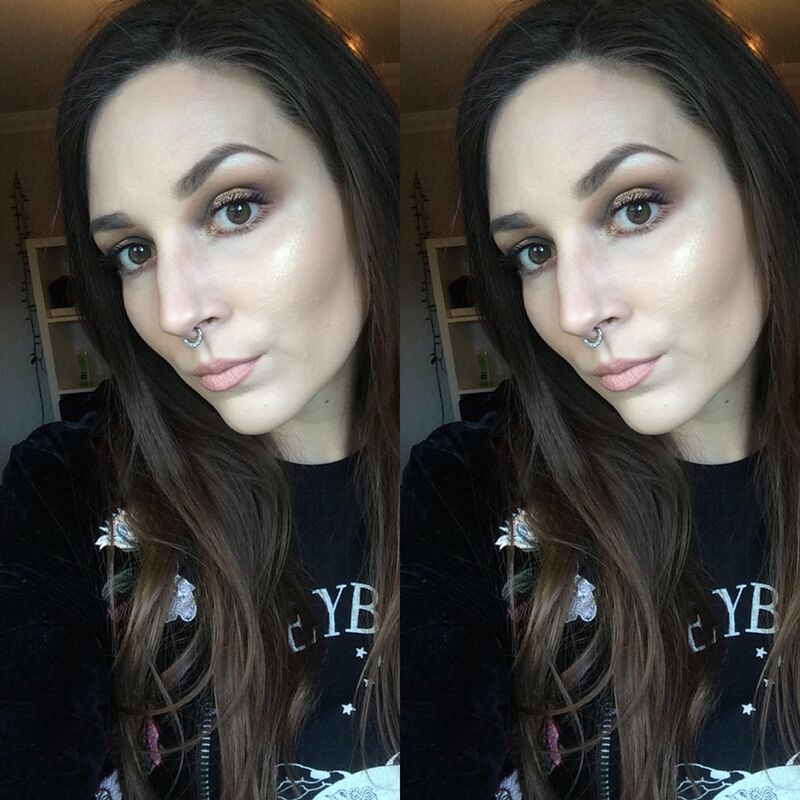 Vegan/vegetarian or gluten free? No problem they have separate menus for both. 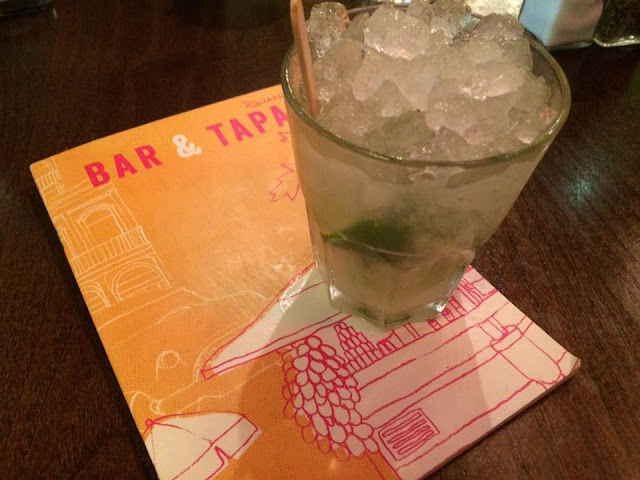 A massive thank you to The Oracle, Ed's Diner, Miller & Carter and Las Iguana for a wonderfully filling evening!